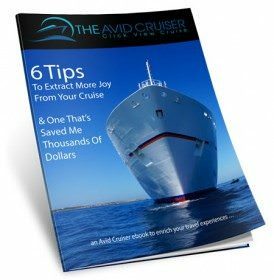 Travel with me on Star Flyer, virtually, by subscribing to the RSS feed or the Avid Cruiser e-mail newsletter. 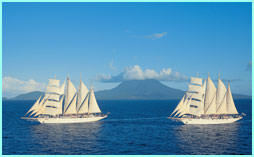 Hi, I have done 3 sailings on Star Clippers, one transatlantic, one Far East and 14 days in the Caribbean. 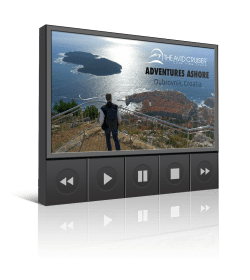 Think you will be pleasantly surprised with accommodations and facilities on board, will be interested to hear your experiences. Can you check to see if handicapped clients can travel with the Star? Also do they accomodate Vegan’s dietary needs? To those who have asked about mobility, I would not recommend Star Flyer to someone with limited mobility. The tenders alone can be challenging as can the walk up the long gangway stairs. Maneuvering around the ship can also be challenging. About the Vegan meals, yes, Star Flyer accommodates. I had Vegan last night, an excellent dish of sauteed vegetables and rice. Also, I find the portions to be extremely reasonable – not too much as to leave you overly full and bloated!